October 15, 2016 – BCW: Bianka defeated Aysha, Indi Hartwell and Natasha Webb in a 4-way match. October 22, 2016 – BCW: Indi Hartwell defeated Bianka. February 18, 2017 – PCW: Chris Trance and Indi Hartwell defeated Bianka and Sammy Falcon. March 4, 2017 – PCW: Bianka defeated Buckle and Indi Hartwell in a handicap match. March 11, 2017 – RCW: Casey Johns defeated Indi Hartwell. April 1, 2017 – WrestleCon Women’s SuperShow: Thunder Rosa defeated Indi Hartwell. April 22, 2017 – PCW: Chris Trance and Indi Hartwell defeated Shazza McKenzie and Unsocial Jordan. June 17, 2017 – PCW: Chris Trance and Indi Hartwell defeated Aysha and Ross Winter. July 28, 2017 – IWA: Savanah Summers defeated Indi Hartwell. August 12, 2017 – PCW: Chris Trance and Indi Hartwell defeated Aysha and Ross Winter. September 2, 2017 – PCW: Indi Hartwell defeated FaceBrooke. September 23, 2017 – PCW: Indi Hartwell defeated Savannah Summers in a tables match. October 13, 2017 – MCW: Indi Hartwell defeated Kellyanne. November 10, 2017 – RISE 5: Hyan defeated Indi Hartwell in a dark match. November 18, 2017 – PCW: Indi Hartwell defeated Niki Nitro by disqualification. December 16, 2017 – MCW: Indi Hartwell defeated Kellyanne. January 13, 2018 – MCW: Indi Hartwell defeated Riebell. 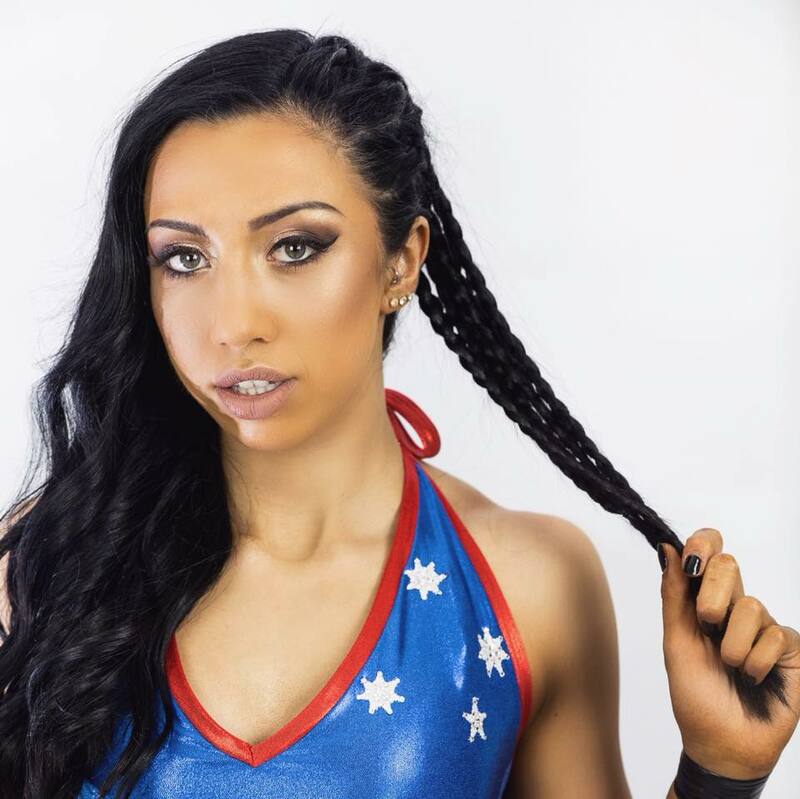 January 20, 2018 – Newy Pro #65: Indi Hartwell defeated Jessica Troy to qualify for the Newy Pro Women’s Title Queen Of The Castle Tournament. March 3, 2018 – PCW: Indi Hartwell defeated Aysha. March 10, 2018 – MCW: Indi Hartwell defeated Aria. March 19, 2018 – WSW: Shazza McKenzie defeated Indi Hartwell. March 30, 2018 – BCW 14: Indi Hartwell defeated Avary. April 21, 2018 – MCW: Kellyanne defeated Indi Hartwell. April 27, 2018 – BCW 15: Indi Hartwell defeated Tarlee in the 1st round. May 5, 2018 – Newy Pro #55: Indi Hartwell defeated Shazza McKenzie in the semi-finals. Indi Hartwell defeated Harley Wonderland to win the tournament and vacant women’s title. May 19, 2018 – MCW: Indi Hartwell defeated Erika Reid. June 9, 2018 – MCW: Indi Hartwell defeated Taylah Rose. June 15, 2018 – RCW: Indi Hartwell defeated Casey Johns to retain the Newy Pro women’s title and winning the RCW women’s title. June 22, 2018 – WSW: Indi Hartwell defeated Laura James. June 29, 2018 – BCW 17: Indi Hartwell defeated Erika Reid in the quarter-finals. June 30, 2018 – BCW 18: Indi Hartwell defeated Kellyanne in the semi-finals. Indi Hartwell defeated Ivelisse to win the tournament and vacant women’s title. July 7-8, 2018 – RRW: Tenille Dashwood defeated Indi Hartwell. July 20, 2018 – WrestleRock: Avary defeated Indi Hartwell and Kellyanne in a 3-way match. July 21, 2018 – MCW: Tenille Dashwood defeated Indi Hartwell. July 27, 2018 – BCW 19: Indi Hartwell defeated Kellyanne and Vixsin in a 3-way match to retain the women’s title. August 18, 2018 – MCW: Bea Priestley defeated Avary and Indi Hartwell in a 3-way match to retain the women’s title. August 25, 2018 – VPW: Indi Hartwell defeated Avary. August 31, 2018 – BCW 20: Melina defeated Indi Hartwell and Katie Forbes in a 3-way match to win the women’s title. September 1, 2018 – BCW 21: Melina defeated Indi Hartwell by disqualification to retain the women’s title. September 1, 2018 – RCW: Indi Hartwell defeated Blair Alexis, Izzy Shaw, Miss Fortune and Savannah Summers in a 5-way match to retain the women’s title. September 7, 2018 – BCW 22: Indi Hartwell & The Kingdom (Gabriel Wolfe and Tome Filip) defeated Dowie James, JXT and Melina, The Kingdom retains the tag team titles. September 8, 2018 – BCW 23: Melina defeated Indi Hartwell to retain the women’s title. September 15, 2018 – New Valhalla Wrestling: Kellyanne defeated Indi Hartwell. September 22, 2018 – Newy Pro #72: Indi Hartwell defeated Madison Eagles. September 23, 2018 – MCW: Kellyanne defeated Indi Hartwell in the 1st round. September 28, 2018 – Iron Fist: Indi Hartwell defeated Joanie May. October 5, 2018 – MCW: Indi Hartwell defeated Shazza McKenzie. October 21, 2018 – SHIMMER Volume 107: Britt Baker defeated Indi Hartwell. October 21, 2018 – SHIMMER Volume 108: Team Sea Stars (Ashley Vox and Delmi Exo) defeated Undeniably Impressive (Indi Hartwell and Tessa Blanchard). November 10, 2018 – ROW TV Taping: AQA defeated Indi Hartwell to retain the Diamonds title. November 19, 2018 – RISE Ascent – Episode 21 (Taped): LuFisto defeated Indi Hartwell. November 23, 2018 – WSW: Brandi Rhodes defeated Erika Reid and Indi Hartwell in a 3-way match. November 24, 2018 – WSW: Brandi Rhodes defeated Indi Hartwell. November 25, 2018 – WSW: Tessa Blanchard defeated Indi Hartwell. December 1, 2018 – Newy Pro #74: Harley Wonderland defeated Indi Hartwell and Shazza McKenzie in a 3-way match to win the women’s title. December 5, 2018 – 1 Fall Studio: Indi Hartwell defeated Freddie Gold. December 6, 2018 – 1 Fall Studio: Lochy Hendricks defeated Indi Hartwell to retain the Openweight title. December 8, 2018 – RCW: Indi Hartwell defeated Blair Alexis and Izzy Shaw in a 3-way match to retain the women’s title. December 14, 2018 – SPW: Alexis Lee defeated Indi Hartwell. January 12, 2019 – MCW: Indi Hartwell defeated Tarlee. January 19, 2019 – VPW: Tarlee defeated Arya Reign and Indi Hartwell in a 3-way match to win the vacant women’s title. February 2, 2019 – MCW: Avary vs. Indi Hartwell ended in a no contest. March 2, 2019 – Wrestling GO! : LUX (Kingsley and Xena) defeated Indi Hartwell and Steph De Lander. March 3, 2019 – MCW: Steph De Lander defeated Indi Hartwell. March 8, 2019 – WSW: Kellyanne defeated Indi Hartwell in the semi-finals. March 9, 2019 – WSW: Indi Hartwell defeated Jordynne Grace. March 16, 2019 – MCW: Avary defeated Indi Hartwell and Kellyanne in a 3-way match. March 23, 2019 – PWA: Steph De Lander defeated Indi Hartwell. March 29, 2019 – RISE 13: Indi Hartwell was in the rumble match won by Zoe Lucas. March 30, 2019 – SHIMMER Volume 109: Indi Hartwell w Steph De Lander defeated Allie Kat. March 30, 2019 – SHIMMER Volume 110: Steph De Lander w Indi Hartwell defeated Brittany Blake, Nevaeh and Veda Scott in a 4-way match. March 31, 2019 – SHIMMER Volume 111: The Killer Death Machines (Jessicka Havok and Nevaeh) defeated Indi Hartwell and Steph De Lander. April 3, 2019 – BCP: Indi Hartwell and Shazza McKenzie defeated Allie Kat and Veda Scott. April 5, 2019 – SHIMMER Volume 113: Hyan defeated Leva Bates, Allie Recks, Brandi Lauren, Brittany Blake, Indi Hartwell, Shotzi Blackheart and Veda Scott in a 8-way match. @indi_hartwell It’s a business plan, with 60gb. @indi_hartwell Pun not intended but I was seriously impressed with your entrance music. Didn't know if it was found somewhere, or custom. All I knew is that it's very fitting and memorable. The first beat is like a slap to the face for attention must be paid.